1. 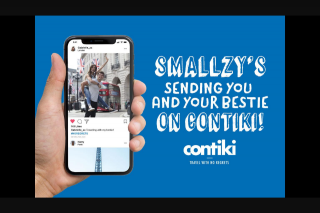 Promotion Smallzy’s sending YOU and YOUR bestie on CONTIKI! Entrants and their companions must be: aged between 18 years of age and 35 years of age. ii. Are you under 35 years of age? Selected Entrant will forfeit its entry into the Promotion and any Major Prize. Challenge as a Challenger (Challenger). be asked to identify the Nominated Location by name. Challenge on the applicable day. Challenger during a contesting spot however the Promoter is under no obligation to do so. (including their Personal Contact Number). discretion) they will be deemed the Major Prize winner and awarded the Major Prize. of age if requested by the Promoter, for the purposes of awarding the Major Prize. 6:00pm AEST Friday 7 September 2018 and 10:00pm AEST on Friday 21 September 2018.
be judged based on the Judging Criteria. residence, to London, UK (inclusive of airfare related taxes and charges). The Major Prize consists of: one winner will win a trip for two on Contiki’s 19 day European Impressions trip. tours and other attractions may be substituted. costs are not included and are the winner’s responsibility unless otherwise stated. 2018 (travel date selected and traveller names confirmed) for travel in 2019.
valid and will be forfeited. Extension cannot be issued.